December 17, 2014 by David Shields. Average Reading Time: almost 6 minutes. George Case Setchell was born December 17, 1838 in Norwich, Connecticut to William Kelly Setchell and Maria E. Case. He was a skilled type cutter and a keen inventor, who perfected the die-cut method of wood border manufacture in the late 1870s, and, in collaboration with William H. Page, the die-cut method of wood type manufacture in the late 1880s. Setchell spent his childhood and most of his adult life in Norwich, Connecticut. 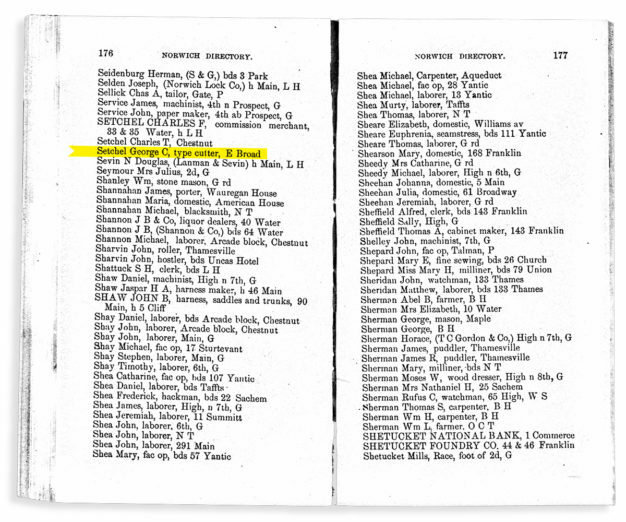 His father died when he was 10 and after his mother’s passing in 1860 he is listed as living with his younger brother, Charles in a boarding house in Norwich. On April 3, 1861, He married Mary Ann Davis, an immigrant from Trowbridge, England. Their first child, Emma Davis Setchell was born April 26, 18621 shortly before Setchell joined the Union Army. He returned to Norwich after the war and became a type cutter for William H. Page & Co. He was first listed as an employee in the 1868 Norwich City Directory5 By 1872 Setchell had worked his way up to foreman of the typeshop, and became President of the William H. Page Wood Type Co in 1881. Though the acquisition would be finalized four years later in 1891, Setchell was not to relocate. In 1889, Setchell sold his complete portfolio of interests in the William H. Page Wood Type Co. to Samuel T. Dauchy of Dauchy & Co. Dauchy became President of the company and oversaw the acquisition by Hamilton Mfg Co in 1891. 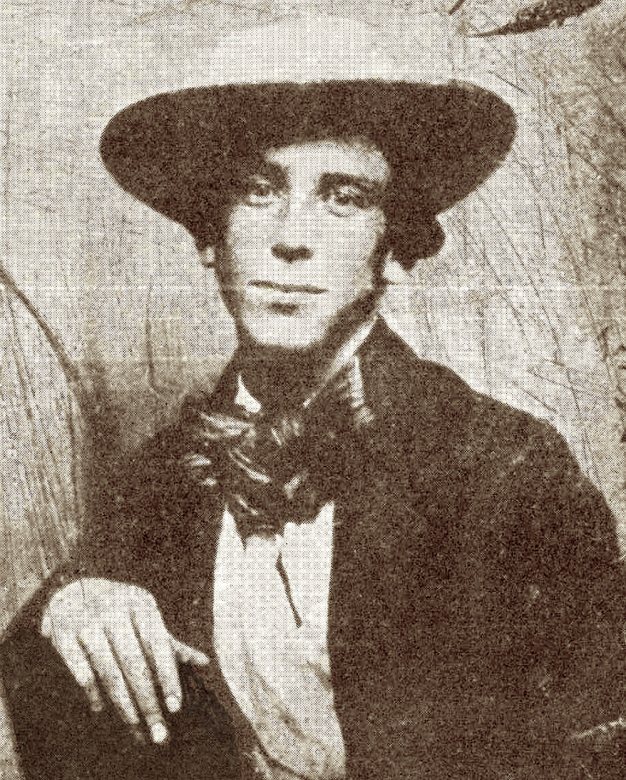 Dauchy had been John Cooley’s partner from 1866–1869. In 1869 when Cooley & Dauchy was acquired by William H. Page, Dauchy purchased Cooley’s portions of the business that included the printers’ warehouse and advertising agency to start Dauchy & Co in New York City. Detail of drawing accompanying Setchell‘s patent specifications, submitted September 24, 1878. It is interesting to note that in the text of the patent description Setchell also indicated that the production of star borders, first shown at least as early as in Page’s 1872 Specimens of Wood Type, had been produced by a stamping method as well. 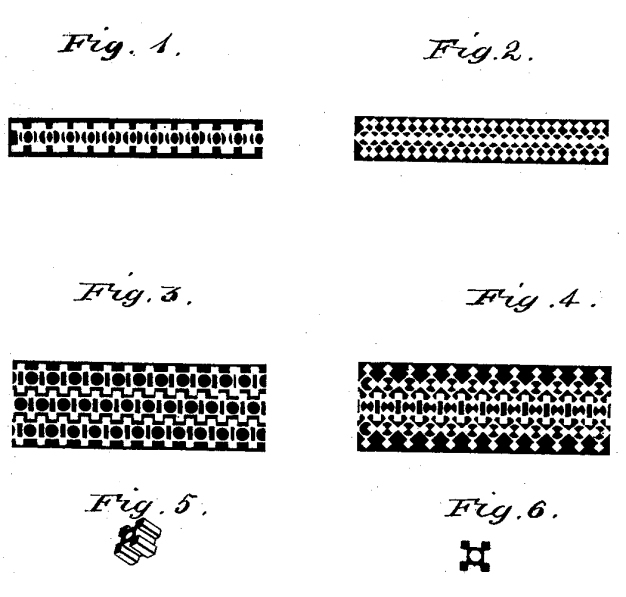 Setchell was to patent individually, and in collaboration with William Page, improvements to the die-cut production method between 1887 and 18898. He also acted as a signing witness for a number of William Page’s design patents starting as early as D7074 October 27, 1873. He submitted his last patent request in May 1914 just five months before his death. New & Useful Improvements to the Trellis9 was granted a patent, posthumously on Feb 19, 1915. In 1889, Setchell sold his interest10 in the William H. Page Wood Type Co. to Samuel T. Dauchy of Dauchy & Company. Setchell remained in Norwich and the following year was listed as the proprietor of Leffingwell & Setchell, and Steam Carpet Cleaning Works. Curiously in 1891 and 1892, he was listed as a grocer, and by 1895 he had moved to New Haven, Connecticut to run the Trellis Mfg Co11. He moved to Philadelphia, Pennsylvania in late 1899 or early 1900 and sometime after 1909 but before 1911 moved to Cranston, Rhode Island to live with his second daughter Jennie Lavinia (Davis). Setchell passed away Thursday, October 8, 1914, at the age of 75 in Cranston, Rhode Island. He is buried in Yantic Cemetery12 in Norwich, Connecticut with his wife Mary Ann Davis (August 25, 1843—June 7, 1927) and other family members.